Dodging cloudy weather, a SpaceX Falcon 9 rocket thundered to life and streaked away from Cape Canaveral early Monday morning, lifting a Canadian communications satellite into orbit while the booster’s first stage plunged back to Earth, settling to an on-target touchdown aboard an off-shore droneship. It was the 16th SpaceX launch so far this year, boosting the rocket’s landing record to 29 successful recoveries, 18 on droneships and 11 on land at the Cape Canaveral Air Force Station. 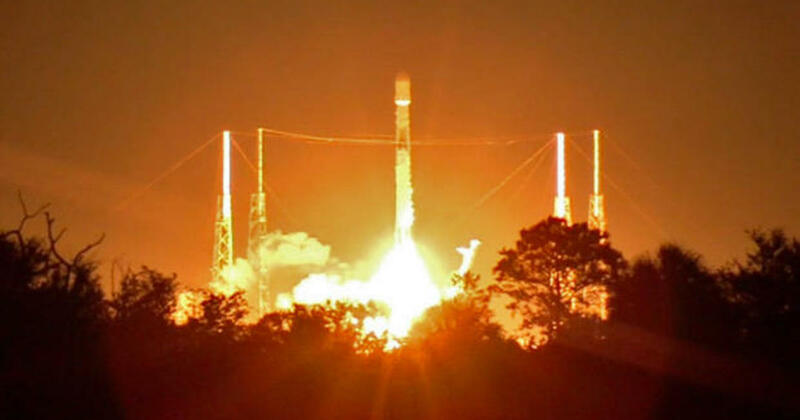 The mission got off to a spectacular start at 12:45 a.m. EDT (GMT-4) when the rocket’s nine Merlin 1D first stage engines ignited and throttled up to full power, quickly pushing the 229-foot-tall booster away from pad 40 at the Cape Canaveral Air Force Station. Mounted in the rocket’s nose cone was Telesat Canada’s Telstar 18 VANTAGE communications satellite, intended to replace an aging relay station already in orbit to provide video, data and mobile communications across China, Australia and the Pacific Ocean region all the way to Hawaii. Liftoff came one hour and 17 minutes late because of stormy weather across Cape Canaveral but the rocket had a four-hour launch window and conditions eventually improved enought ot permit a safe takeoff. Arcing away to the east, the Falcon 9 put on a dramatic show for area night owls as it knifed through low clouds and arced out over the Atlantic Ocean, rapidly accelerating toward space atop 1.2 million pounds of thrust. Two-and-a-half minutes after liftoff, after pushing the rocket out of the thick lower atmosphere, the first stage engines shut down as planned, the stage fell away and the flight continued on the power of a single Merlin engine in the rocket’s second stage that quickly faded from view. The Falcon 9’s first stage, meanwhile, flipped around and plunged back into the discernible atmosphere, firing up three of its engines to slow down for re-entry. As the rocket plummeted toward Earth, computer-controlled titanium “grid fins” at the top of the stage moved about to maintain the booster’s orientation as it headed for the drone ship “Of Course I Still Love You” stationed several hundred miles east of Cape Canaveral. Nearing its target, the rocket re-started a single engine to slow down for landing, extending four legs and settling to an on-target touchdown on the deck of the droneship, SpaceX confirmed. Another view of launch as the Falcon 9 climbed away from the Cape Canaveral Air Force Station. Landing came about 15 seconds after the Falcon 9’s second stage engine completed the first of two planned “burns,” putting Telstar 18V into an initial parking orbit. A second burn was executed 26 minutes after launch to complete the job and the Telstar 18 VANTAGE satellite was released to fly on its own about five minutes later. While SpaceX did not provide details, communications satellites are typically placed in highly elliptical “transfer” orbits with high points around 20,000 miles or higher and low points just a few hundred miles up. On board thrusters are then used to circularize the orbit at 22,300 miles above the equator where satellites take 24 hours to complete one orbit and appear stationary in the sky as the Earth turns. That allows the use of fixed ground antennas, greatly simplifying space-based communications. Built by SSL (formerly Space Systems/Loral), Telstar 18 VANTAGE is a joint venture between Telesat Canada and the Hong Kong-based APT Satellite Co. The satellite’s exact cost was not revealed, but it is believed to be around $200 million. “We have an embedded base that’s on T18 (Telstar 18) today that will migrate over to T18 VANTAGE,” Tom Eaton, vice president of Telesat international sales, told Spaceflightnow. The relay station tips the scales at more than 15,560 pounds and is equipped with high-speed Ku-band and C-band transponders, providing coverage stretching from India and Pakistan to Hawaii and enabling “direct connectivity from any point in Asia to the Americas,” the company said in a release. “Telstar 18V has a broad C-band beam over Asia which is similar to the one on Telstar 18, the satellite it will replace,” Dan Goldberg, Telesat president and CEO, said in a July quarterly earnings call. Next up for SpaceX is launch of Argentina’s SAOCOM 1A Earth observation satellite on Oct. 7. That flight will take off from Vandenberg Air Force Base, Calif., and the rocket’s first stage will attempt to land back at the launch site, the first landing in California.